Bio Green Fertilizer is Safe for your Family and Pets! We want to hear from our customers, yes that means YOU! You are the most important part of our business. We always appreciate feedback as it is a valuable part of our ongoing quality control process. We want to make sure that our technicians, service, and products are meeting and exceeding your expectations. Please take a moment to leave us your thoughts regarding your experience with Bio Green of Orlando via the CONTACT FORM. Thank you, we appreciate it! I Love My New Yard! Wow! I love my new yard! I’ve only been using Bio Green for 3 months now, and it’s like I have a whole new lawn. The weeds are gone, and the grass is coming back thicker and greener than ever before. I also recently planted a vegetable garden and am having that fertilized too, with the all-natural, non-toxic fertilizer. The tomatoes and strawberries are growing like crazy- I officially have a green-thumb! Thanks for providing such a great service. I can’t tell you how nice it is to walk around my yard these days. Because of your Bio Green fertilizer, my St. Augustine grass is now a rich, Kelly green – greener by far than it’s ever been before. I like to tour my property, watching how fast the grass is growing, pushing out weeds, and filling in all the bald spots. It’s becoming the envy of the neighborhood. And now the grand kids can play in the yard anytime – even an hour after you put down a treatment. Thanks, Bio Green! It takes a team to maintain a great lawn. From the folks who cut it, to the folks who keep it fertilized and pest free to the homeowner. When it comes to MY yard, the folks at Bio Green are the MVP’s of the team. They are professional, responsive and most importantly knowledgeable. Not only do I get the top-notch service I demand, they go the extra mile. When I noticed an issue, their folks were on-site within 24 hours treating the problem spot. Add in the eco friendly aspect of their product and they become all around winners! Steve T, Longwood, FL Satisfied customer! I Wish We’d Signed Up Sooner! The Bio Green approach makes so much sense, I wish we’d signed up sooner! The combination of services are a tremendous benefit for our family. We very happy with Bio Green! We just wanted to let you know how pleased we are with Bio Green’s services since you have started treating our yard! We tried using several companies in the past and our yard never met our expectations. 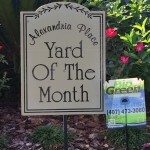 Since using Bio Green’s services and treatments, our yard has never looked better, in fact, we just recently received “Yard of the Month” and we have not received that in years!! Thanks so much for your professionalism and support in dealing with our lawn needs! We will highly recommend Bio Green!! 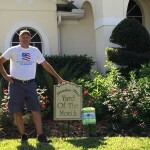 Yard of the Month~Thanks Bio Green of Orlando!